1.Takai Y, Kishimoto A, Iwasa Y, Kawahara Y, Mori T, Nishizuka Y. Calcium-dependent activation of a multifunctional protein kinase by membrane phospholipids. Download ppt "1.Takai Y, Kishimoto A, Iwasa Y, Kawahara Y, Mori T, Nishizuka Y. Calcium-dependent activation of a multifunctional protein kinase by membrane phospholipids." Palm Cooling Delays Fatigue during High- Intensity Bench Press Exercise Grant Weaver, Sam Vaninger, Brett Vihnanek. Development of a Non-pharmacological Model of Cognitive Impairment for the Evaluation of Putative Pro-cognitive Agents – Potential Relevance for Age-Related. For the Reaction Test, participants pressed and held down a light directly in front of them. Another light would illuminate on the other side of the board. Measures De-identified data from required spring training measurements were provided by the team NSCA certified strength coaches (CSCS) for analysis. Anthropometric. TEMPLATE DESIGN © PHOSPHATIDIC ACID INCREASES LEAN BODY MASS AND STRENGTH IN RESISTANCE TRAINED MEN David R. Williams. Grant Weaver, Sam Vaninger, Brett Vihnanek. 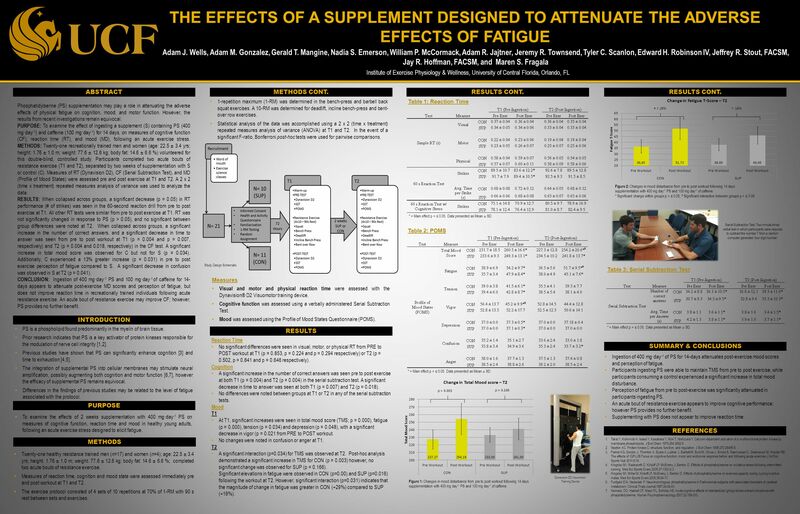  This study was meant to examine the acute effects of a caffeine- containing supplement on upper and lower. PCr recovery in female endurance runners and sedentary controls Anonymous Exercise Science June, 2006. TEMPLATE DESIGN © MAXIMAL ISOMETRIC HANDGRIP STRENGTH IS ASSOCIATED WITH MEASURES OF PHYSICAL HEALTH IN OLDER ADULTS Tyler. Jeremy R. Townsend 1, Aaron B. Morton 2, Adam R. Jajtner 1, Adam Gonzalez 1, Gerald T. Mangine 1, Adam J. Wells 1, Maren S. Fragala 1, Edward Robinson. By: John, Adam, and Andrew. Purpose  To explore the effect of free weights and elastic tubing resistance training on physical self-perception in adolescents. Weight Training Questions. Is it possible to increase the number of muscle fibers by resistance training?